Ever wondered how to take bacon to the next level of foodie nirvana? This is it! 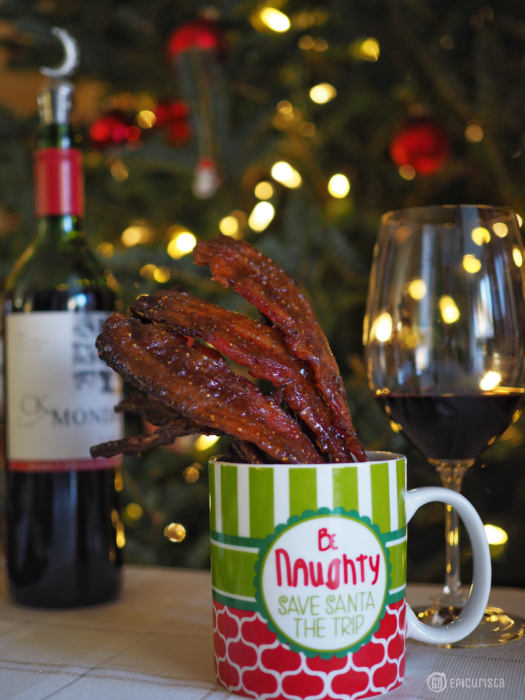 Candied Bacon & Wine. Bacon! If you love it, you know what I’m talking about. Bacon lovers have an almost insatiable appetite for the indulgent pork product and go crazy for anything that even mentions it. It’s no surprise it has been a top food trend for years and one that shows no signs of going away any time soon. It’s added to everything from your classic burger to ice cream and cookies, jam and Bloody Mary’s. A search for “bacon” on Amazon yields 154,818 products! You’ll find hilarious t-shirts (“Bacon, I Am Your Father” to wacky Bacon Gumballs ! It’s no surprise. Everything tastes better with bacon! Yet, other than your morning breakfast, it’s not often you eat bacon all by itself. Now, you can eat bacon any time, including parties! Enter: Candied Bacon. The first time candied bacon touched my lips was at Orlando’s BBQ restaurant American Q. Their “Swine Candy” was reason alone to fight the traffic on the drive to the Disney Lake Buena Vista area. It was served as a bar snack / appetizer and made it very difficult to limit yourself to just one, no matter how much restraint you may have told yourself you would have “just one.” The sweet / salty bacon combo candied with molasses brought smiles to the table every time. Then, I encountered famed Datz Restaurant in Tampa, Florida at the Clearwater Uncorked wine tasting event and I knew bacon was king. Where gourmet restaurants featured seared scallops and tenderloins, the good folks of Datz served nothing but bacon – from teriyaki to chocolate covered – mounds and mounds of bacon! They had a line of anxious bacon lovers longer than the eye could see. A true testament to the power of bacon! As I was playing around in the kitchen, creating a decadent Stuffed Brie Panettone party appetizer as part of my collaboration with CK Mondavi Wines, I kept fretting about what could take this dish to the next level of foodie nirvana. Thoughts of the Swine Candy popped in my head like instant eureka! 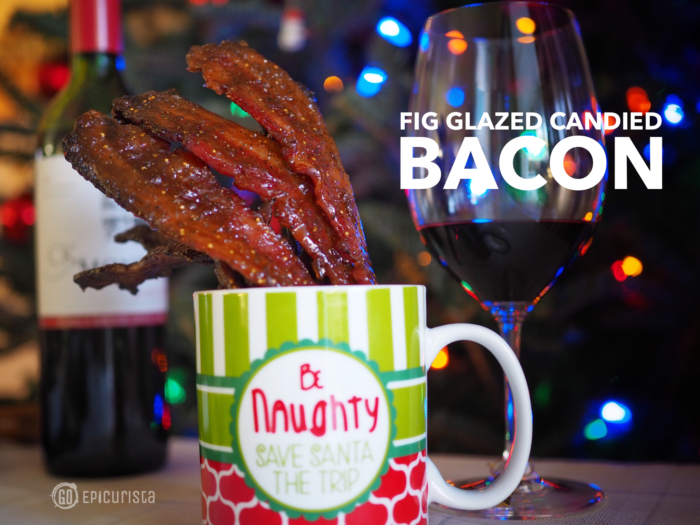 I found my answer: Fig Glazed Candied Bacon! To keep things simple, I used the same fig jam I used in the stuffed brie panettone recipe to glaze thick-cut applewood smoked bacon. Then, topped it with a mixture of brown sugar, real maple syrup which I bought this summer in Vancouver BC, salt, pepper and a pinch of cayenne pepper for a little heat. Bacon is ready for the oven! The result was a salty, sweet, spicy, meaty treat that we could not get enough of! I ended up making two batches! My husband and my neighbors – aka “taste testers” couldn’t stop at just one. It’s a perfect party snack. Guaranteed your guests will be fighting for the last piece. Fresh out of the oven. You’ll have to practice restraint and wait for the candied bacon to cool down. Then devour! The best part about this recipe is you can modify it and play with it. If you don’t like fig, use your favorite preserves. You can also turn up or turn down the heat by adjusting the amount of pepper you use and even play with other fun flavors like Asian five spice and garlic. Have fun with it! That’s what bacon is all about, right? Fig glazed candied bacon is also a fantastic topping for creamy brie or your favorite salad greens. Check out my Stuffed Brie Panettone recipe for an impressive appetizer that offers an incredible explosion of flavors. The possibilities are endless, because after all, everything is better with bacon! 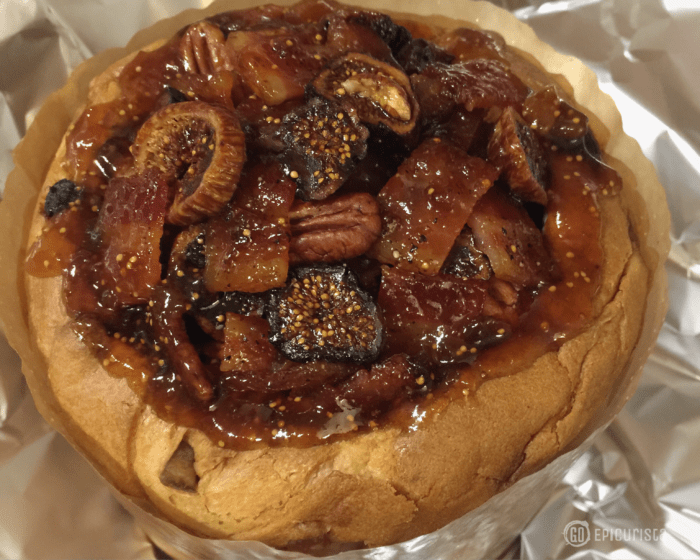 Brie Stuffed Panettone with candied bacon, figs and pecans. Absolutely decadent! What’s even better than candied bacon? 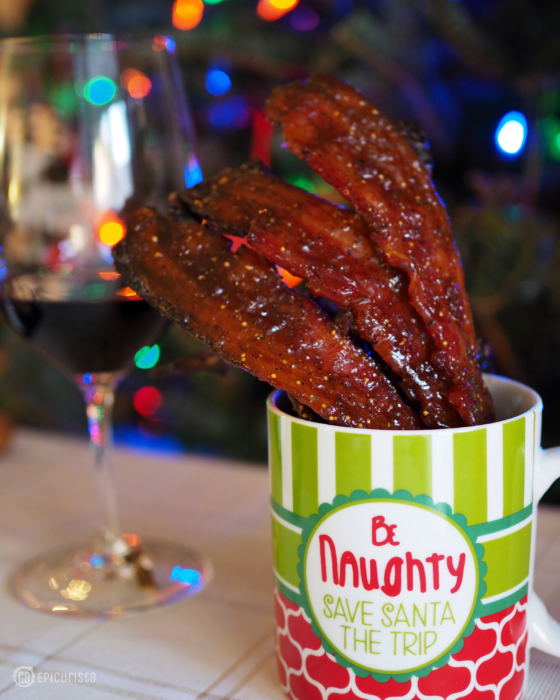 Candied Bacon and Wine! Perfect Pairing! 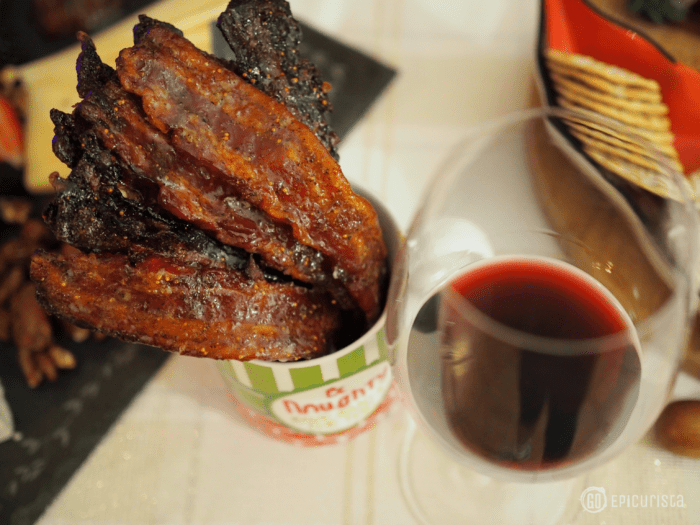 You’ve probably never thought about pairing wine and bacon but they go quite well together. Select a rich red with notes of black fruit, ripe plum, cherries, and blackberries which will bring out the fig and maple flavors and spicy notes of the bacon. A jammy zinfandel, spicy syrah or red blend are a perfect pairing. I paired my fig glazed candied bacon with my favorite CK Mondavi Wine, Scarlet Five. This full-bodied, Bordeaux style red blend of Cabernet Sauvignon, Merlot, Cabernet Franc, Petite Verdot and Malbec, is rich and sophisticated, yet a super fantastic value (retails around $7-9/bottle), so the only indulgence is for your taste buds and not your wallet. I’m a fan of red blends. They are bold, fun and interesting. Whereas Cabernet Sauvignons tend to be more elegant, the Scarlet Five red blend says “I can be sophisticated but I also like to let my hair down”. Just as comfortable paired with a gorgeous filet as a juicy burger – or in this case, bacon! To see other recipes paired with CK Mondavi wines, check out what other CK Ambassadors like me are cooking up by searching #CKMondaviAmbassador #CKMondaviWines and #CKMondaviHoliday hashtags on Facebook, Twitter,Instagram and Pinterest. Guaranteed you will find awesome dishes to make at your next gathering. 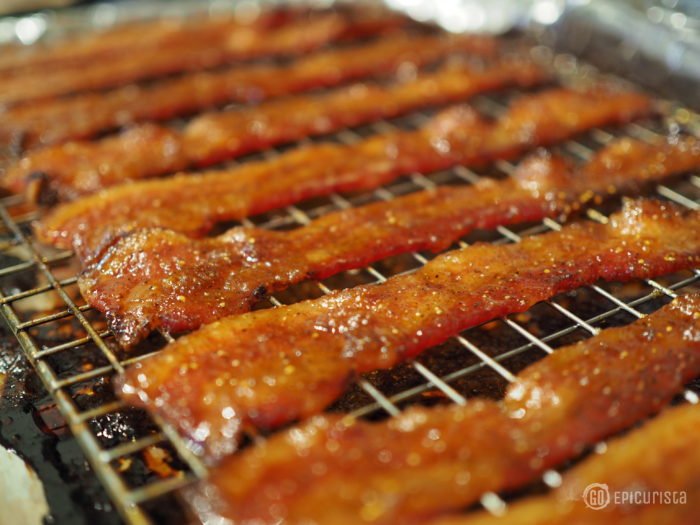 Have you ever tried candied bacon? I would love to hear your ideas for what you will top with candied bacon next. Guaranteed you’ll have a good time. Because, do I need to say it? Wine, Cheese and Bacon! And because throwing a party doesn’t have to break the bank, look for CK Mondavi’s special holiday promotions on their wine bottles in stores now through January 31, 2017. You can receive $1 off PRÉSIDENT® Brie, $1 off RONDELÉ® BY PRÉSIDENT® and $1 off any crackers. Make it an epic party with candied bacon! Oh, and did I mention you can also win a trip to Napa?! Because bacon and wine was not enough to tempt your taste buds. I have more good news from CK Mondavi! They are giving away a wine country weekend in Napa. All you have to do to enter is text CKMONDAVI to 31279 (The deadline to enter is 12/31/16). If you love wine as much as I think you do, then you want to enter. Disclosure: I am thrilled to have been selected to be a CK Mondavi wines ambassador for 2017. I am compensated for this post, however, I only choose to collaborate with brands I enjoy. I love their great quality value wines, and more importantly the company’s values and the family behind them. This is a fourth generation family run business that is 100% American. It is an honor to partner with them to share with you awesome wine pairing tips and easy entertaining recipes. All opinions and recipe creations are my own. This post may contain affiliate links via Amazon Services LLC Associates Program. At no cost to you, when you make a purchase through this link, I earn a small commission which helps with website costs. Thank you for your support! A salty, sweet, spicy fig glazed candied bacon is the perfect party treat all on its own or as a topping for creamy brie and sweet figs or your favorite salad greens for an explosion of flavors. Line rimmed baking sheet with aluminum foil. Spray wire rack with non-stick cooking spray and place on the foil lined baking sheet. Place bacon strips on the greased wire rack. Place the fig jam/preserves in a microwave-safe dish. Microwave for 20 seconds to soften. Brush fig preserves onto one side of each bacon strip. In small bowl, combine brown sugar, maple syrup, black pepper, salt and cayenne pepper. 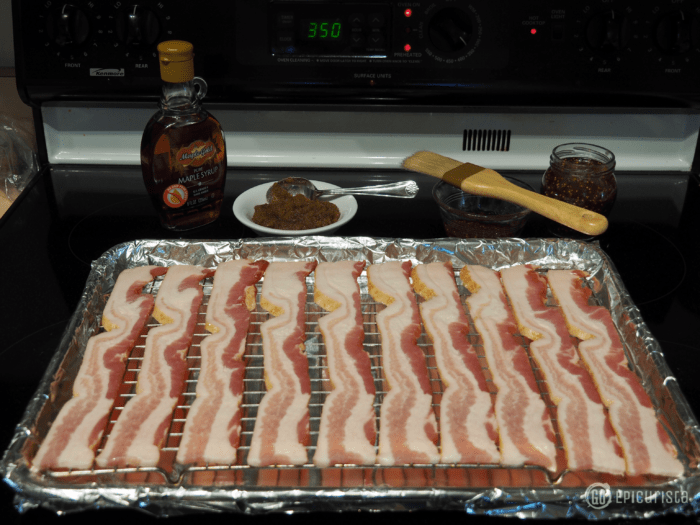 Evenly spread the brown sugar mixture on each piece of bacon, pressing it on the bacon with the back of a teaspoon. Bake for 30 minutes or until bacon is crisp and browned. Adjust based n your oven. You may need to check it at 20 minutes to prevent from burning or extend baking time. Remove bacon from the oven and let cool. Carefully lift it off the rack to avoid sticking. Bacon can be made in advance and stored in a ziplock bag for one day (Warning: you must hide it or chances are it will be gone before you're ready to serve it!). Serve whole candied bacon strips in a mason jar or large glass. The candied bacon can also be chopped and used as a topping on baked brie and salads. I’ve never had fig jam- can I get it at the store or do I have to make it homemade? I really need to make this bacon! You can find fig jam in your grocery store or gourmet foods store. I usually find it near the cheese case. You can also order online on Amazon or World Market. The brand I used is called “Dalmatia Fig Spread” but there are many others. You can also use any other kind of preserves you’d like. 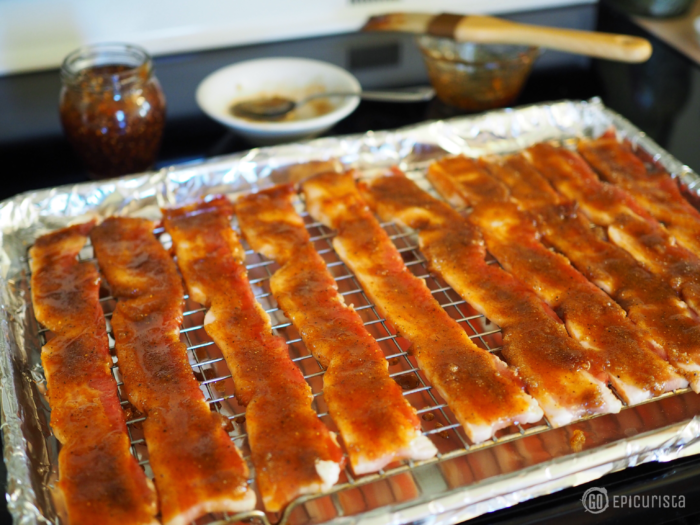 I hope you will make this candied bacon soon! Cheers and thanks for stopping by Go Epicurista. This looks so amazing!!! I love fig jam. I love bacon. I love wine. This is a winner! Thank you Nichole! It’s the epic tasty trifecta. Cheers to a great holiday!